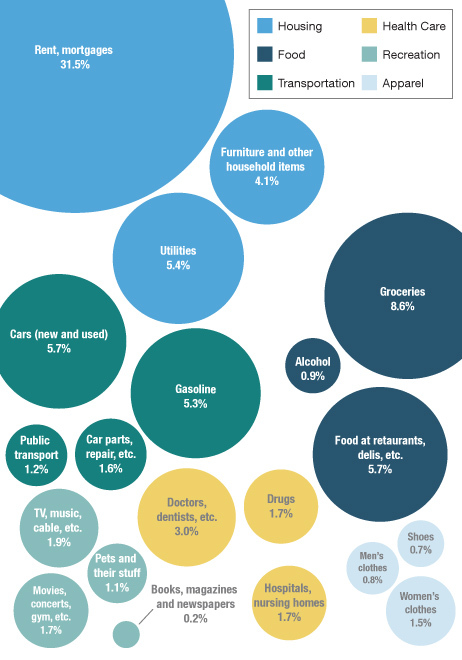 A breakdown of what the average American household buys, based on government data (PDF) for December, 2011. We didn’t include everything, but we included the biggies, as well as some smaller categories that caught our eye. This entry was posted in Domestic Tranquility, General Welfare and tagged Culture, Domestic Policy, Economy, Fiscal Policy, Jobs, Leadership, Middle Class, Monetary Policy, Poverty, Recession, Unemployment by Ronald Grey. Bookmark the permalink. A third of our money to the richest people on Earth!!! Or at least the ones who get the money legitimately!!! Thank you for writing! We have not yet begun to succeed.